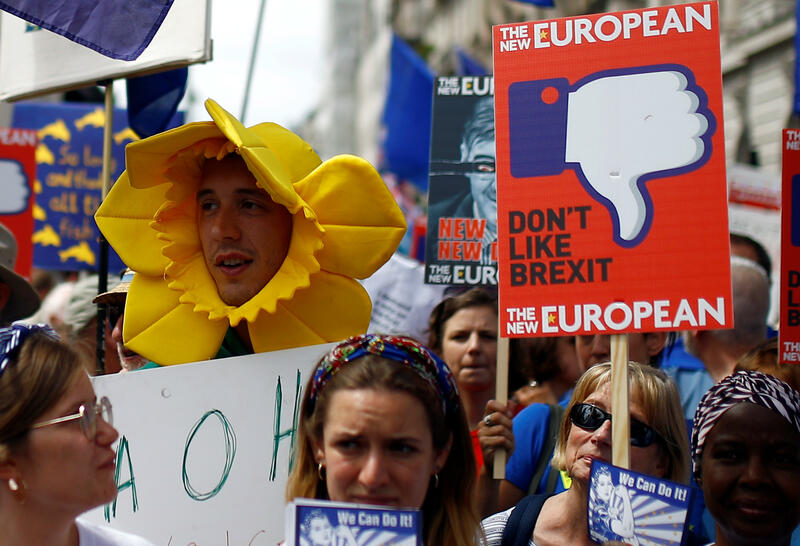 LONDON -- Tens of thousands of anti-Brexit protesters marched Saturday in London to demand a new referendum on leaving the European Union, as a divided Britain marked the second anniversary of its vote to quit the bloc. Organizers of the People's Vote march say Brexit is "not a done deal" and people must "make their voices heard," BBC News reports. Leading Brexit supporters, meanwhile, warned the British government not to delay or water down the divorce from the 28-nation bloc. Foreign Secretary Boris Johnson said Prime Minister Theresa May must deliver the "full British Brexit" that voters were seeking. Britain voted 52 percent to 48 percent on June 23, 2016 to quit the EU, and its official exit is slated for March 29, 2019. But the country - and its Conservative government - remain divided about what kind of economic relationship it wants with the EU. Opponents of Brexit, many waving EU flags, marched through central London to Parliament on Saturday, calling for a referendum on whatever divorce deal is agreed between Britain and the EU. The crowd numbered in the tens of thousands, with organizers estimating 100,000 people took part. Police did not give an official estimate. A rival pro-Brexit march, demanding that the U.K. not compromise with the EU, drew a far smaller crowd. The People's Vote campaign, which organized the march, argues that public opinion is turning against Brexit as the economic costs become clearer. It came as senior Cabinet ministers, including Liam Fox and David Davis, insisted the U.K. is prepared to walk away from talks without an agreement, BBC News reports. The protest is part of a "summer of action" by campaign groups designed to increase pressure on May and Labour party leader Jeremy Corbyn. James McGrory, one of the organizers, said voters were "made all kinds of promises" during the Brexit referendum. "But two years later, all we've got are broken promises, an economy that's already feeling the strain of Brexit and a government paralyzed by internal divisions," he said. Protester Matthew Mann, a Briton who is married to a French woman and lives in The Netherlands, said he was "here to show what a European looks like." "I have lived and worked across Europe - it's home," he said. The leaders of both Britain's Conservatives and the opposition Labour Party oppose holding another Brexit referendum, though many members of both parties disagree. Smaller parties, including the Greens and the centrist Liberal Democrats, support having a new Brexit vote. "Brexit is not a done deal. Brexit is not inevitable. Brexit can be stopped," Liberal Democrat leader Vince Cable told the crowd. The government is determined to see Brexit through but May's Cabinet is split over how to proceed, with Brexit-backing ministers such as Johnson calling for a clean break so that Britain can strike new trade deals around the world. Others, including Treasury chief Philip Hammond, want to keep closely aligned to the bloc, Britain's biggest trading partner. In an article for The Sun newspaper, Johnson said May must not deliver a "half-hearted" Brexit, which he likened to a roll of toilet paper - "soft, yielding and seemingly infinitely long." International Trade Secretary Liam Fox told the BBC the EU needs to understand that Britain is willing to walk away from the Brexit talks without agreement if necessary, because "no deal would be better than a bad deal." Amid the uncertainty, EU leaders are growing frustrated with what they see as a lack of firm proposals from the U.K about future relations. A paper setting out the U.K. government position on future relations, due to be published this month, has been delayed until July because the Cabinet cannot agree on a united stance. Many businesses warn that a failure to reach a free-trade agreement between Britain and the EU would be an economic disaster. European plane-maker Airbus warned Friday that it could leave Britain - where it employs about 14,000 people - if the country exits the EU without an agreement on future trading relations. Katherine Bennett, the company's senior vice president in the U.K., said "a no-deal Brexit would be catastrophic."